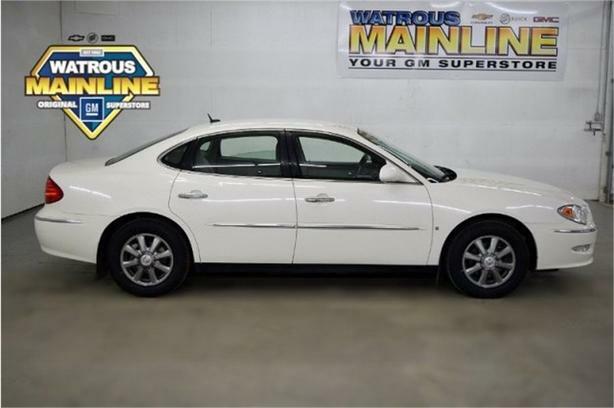 Grand and graceful, this 2008 Buick Allure will envelope you in well-designed charm and security. With a Gas V6 3.8L/231 engine powering this Automatic transmission, you'll marvel at this ultimate collaboration between the forces of mother nature and the laws of physics. It is well equipped with the following options: 3.8L SFI V6 3800 SERIES III ENGINE -inc: electronic throttle control (STD), Variable intermittent flat blade windshield wipers w/wet arm, Tire Pressure Monitoring System, Tilt adjustable steering column, Theft deterrent system w/electric immobilizer, Steering wheel mounted cruise control, Solar Ray tinted glass, Single Stainless Steel Exhaust, Retained accessory pwr for windows & radio, and Remote keyless entry-inc: pwr trunk release, panic feature & illuminated entry . Visit Watrous Mainline Motor Products Ltd at 208 1st Avenue East Box 70, Watrous, SK S0K 4T0 today.